For the first time in over 15 years, the Los Angeles Clippers have bolstered their roster with a duo of lottery picks. 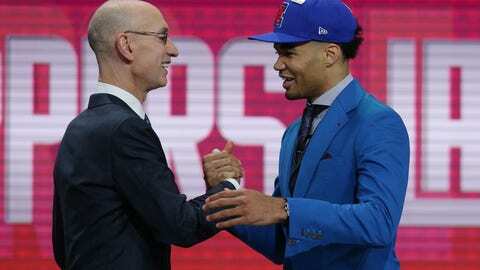 The Clippers acquired the 11th overall pick Shai Gilgeous-Alexander (guard, Kentucky) after trading the 12th overall selection and two future second-round picks to the Charlotte Hornets, who initially drafted the former Wildcat. The 6-foot-6, 180-pound guard was named second team All-SEC after averaging 14.4 PPG and 4.1 RPG as a freshman last season. The Canadian said he felt really good about playing for a “player’s coach” like Doc Rivers and specifically mentioned his ability to teach Chris Paul and Rajon Rondo during their All-Star years. Gilgeous-Alexander also noted he studies a lot of Paul’s film in pick-and-roll situations from when he was with the Clips. With the 13th overall pick, the Clips selected Jerome Robinson (guard, Boston College). Robinson is the first player to ever be selected in the lottery out of Boston College. The 6-foot-6, 190-pound shooter averaged 17.7 PPG over three years in college and shot 40.9% from three as a junior last season. The doubters certainly didn’t come from his ACC opponents. The Clippers acquired the 13th pick from the Detroit Pistons as part of the mid-season trade that sent Blake Griffin to the Motor City. The Clippers are hoping Gilgeous-Alexander or Robinson develops into the franchise’s sixth Rookie of the Year and both play pivotal parts in returning the team to the postseason after missing the playoffs for the first time since 2010-11. Each of them called the other dynamic playmakers, citing each other’s ability to create space and free up his teammates to make big plays. Only three other players on the Clippers roster (Wesley Johnson, Danilo Gallinari and Austin Rivers) were drafted earlier than 12th overall. This is the first time since 2002 the Clips had two lottery picks, first time since 2010 they drafted anyone in the lottery (Al-Farouq Aminu) and 22nd time since 1982 the team made a trade on draft day.